The New York City Department of Transportation has conducted a study to evaluate the feasibility of reintroducing passenger rail service on the Lower Montauk Branch line. 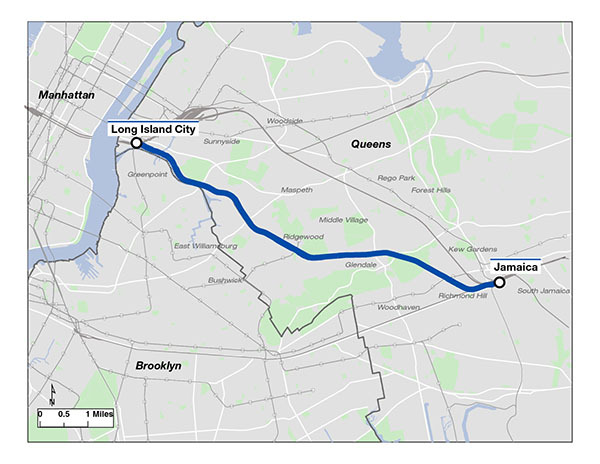 The branch connects the existing Long Island Rail Road stations of Long Island City and Jamaica, passing through the neighborhoods of Maspeth, Ridgewood, Glendale, Middle Village, and Richmond Hill. The Long Island Rail Road provided passenger service along the branch at five stations until 1998. Currently, the branch is used for freight service only. This study, which was sponsored by former Council Member Elizabeth Crowley, explored options for restoring passenger service that responds to the needs of adjacent neighborhoods, explored development potential to support passenger service, and balanced the demands of current and future freight rail activity.